While not necessarily directly related to performance, the vast majority of people I have worked with at some point ask questions about “losing weight, getting leaner, toning up, dropping fat etc”. This makes perfect sense for health, lifestyle, and fitness reasons. From talking with them it’s immediately obvious that most of them are trying to achieve their goals with limited, or simply incorrect knowledge. Hopefully this article can help. Banish the term weight loss from your vocabulary. FAT loss is what we are looking for. Losing weight in the form of muscle mass will likely make you look worse even though you will be lighter/smaller. So stop using just scales and start getting body fat, lean mass, and inches measured. I encourage you to research the availability of Dexa scans in your area. Calories in vs calories out is key for weight loss, but by altering our macro nutrient (protein, carbohydrate, fat) consumption we change how much we can maintain/gain muscle mass while losing fat. Strength train 2-4 times per week, sweat hard 2-3 times per week, don’t be a glutton. Fear not , for a number of reasons, mainly the hormone differences between males and females and also the fact that you are going to be burning off more calories than you are consuming (caloric deficit) getting big and bulky will almost certainly not be an issue. Even for males, muscle is actually pretty hard to gain and is a long, slow process, so if things start going in a direction you don’t like there will be plenty of time to adjust your training. Getting back on point, muscle is critical to help you look the way you want, and also burns more calories than fat, both of which are positives. “Toned/defined” used by women or “lean/ripped” used by men are phrases commonly heard but rarely understood. Essentially both are combination of well-developed muscle, and a low(ish) level of body fat. Without muscle mass (developed by strength training) you will have no definition, curves, tone, build, or whatever you prefer to refer to It as depending whether you are male or female. With too high a level of body fat all your nice looking muscles will be hidden underneath your excess fat. Now that we know we want muscle, and don’t want fat let’s look at how to accomplish this with diet and training. There is actually no such thing as toning. Muscle mass can be gained or lost. Fat can be gained or lost. We can’t tone muscle, just build it. We can’t convert fat to muscle, just lose it. We also can’t localise fat loss from a certain area, so doing extra crunches to burn stomach fat, or tricep exercises to lose the bingo wings is a complete waste of time. Doing extra work on a particular body part may well increase the size of those muscles, but this won’t make any difference to how “toned” you look if they are covered by too much bodyfat. No matter where in your body you are trying to lose fat from, you must do it by reducing your overall bodyfat percentage. I outline practical ways to do this below. Calories in vs calories out (energy balance) is the most important element in weight gain and weight loss. This is simple maths, burn off more fuel than we take in and we will lose weight, and vice versa. The problem with this overly simplistic approach however is that it does not take into account fat weight lost and muscle weight lost. As we know we want to preserve as much muscle mass as possible while losing fat. Consuming a greater proportion of overall calories from protein can accomplish this (Tang et al 2013). This is not the only reason that protein is a key compound for your beach body goals however. As we will learn it has a whole host of benefits. 1) Meals high in protein increase satiety (makes you feel fuller) compared to meals with normal or low protein levels. If our hunger is controlled we are less likely to go searching for snacks, or “picking” on foods which can substantially increase calories without us even really noticing. This is extremely important, because if you are hungry all the time, your nutrition plans will fail. 2) Protein has the highest thermogenic effect of all foods. This means that your body must burn more calories to digest, assimilate, and dispose of calories taken in from protein when compared to fat and carbohydrates. 3) It is harder to overeat (consume too many calories) when meals are based around protein. What is more filling, which one can you see yourself overeating with more easily? I suspect for the vast majority of people It would be rice. There is nothing wrong with carbohydrates, it’s simply just very easy to consume them in very high quantities, driving up your calorie intake. Suggested protein intakes from governing bodies are aimed at the general population but not optimising response to resistance training. The RDA for protein for the general population is 0.8g.kg per day ( During periods of frequent intense strength training protein intakes of 1.3-1.8g.kg per day or even up to 2g.kg per day when aiming for fat loss during a calorific deficit are recommended. (Phillips and Van loom 2011). Important to note for golfers, there will also be a decrease in speed, power, & strength, not good for your club head speed. Fortunately these unfavourable changes can be reversed with a well structured resistance / strength training program. Combining the three key elements that have been mentioned (strength training, high protein intake, calorie deficit) can have powerful effects on your body composition. In a 2013 study carried out by Westcott and Loud (2013), when subjects combined strength training (, a moderate calorie restricted diet (1200-1500 calories for women, 1500-1800 for men), and a high protein intake 1.5g.kg per day, lost an average of 3kg of fat and gained 1kg of muscle during a 10 week training programme. For such a short time period these are very encouraging results, and would likely cause a noticeable visual difference in the subjects IMO. These principles need to become part of your lifestyle for the long term to see prolonged consistent progress. Remember lifestyle, not (*insert number of weeks*) program. 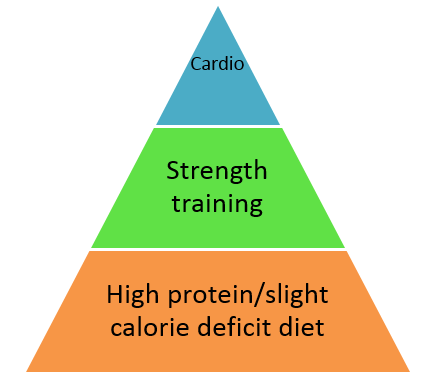 Look at the two pyramids below and see if either of them accurately describes your current approach to training for body composition improvements. From countless conversations and observations from working in a gym setting for the previous eight years I see a common trend among unsatisfied members/clients who are looking for body composition improvements. 1) They all enjoy exercise classes such as aerobics, spinning, circuits, , yoga etc. While these classes have absolutely nothing wrong with them and have their place, a lot of people seeking better bodies (particularly females) think the more you sweat = the better the body and because of this only perform these aerobic type activities, which is problematic. 2) Diets are low in protein: Breakfast is usually toast or cereal, morning snack is a scone or fruit or cereal bar, lunch is a ham sandwich and soup, dinner is usually a good solid meal, late night snacking usually high in sugar. This shows a diet based mainly around carbohydrates with protein as an afterthought, not ideal. 3) Strength training is avoided: Strength training is either completely absent due to the fear of touching a weight will instantly cause bulging muscles all over, or else is limited to completely insufficient exercises and intensity levels. If you are using a weight that you can lift more than 15 times, or you are not struggling to complete the last couple of reps of each set you are not using adequate resistance. 1) Base each meal/snack around a protein source and vegetables/fruit. Be careful of carbohydrates and sugar, not because they are inherently bad, but because they are very easy to overeat. If you find energy lacking in your training sessions include carbohydrates in the meal beforehand. 2) Strength train 2-4 times per week with a progressive program designed by a reputable trainer and make sure your technique is correct. This training needs to be somewhat difficult, and you might have to go slightly outside your comfort zone in terms of what you are used to. You will likely perform 3-6 sets of 3-10 reps for 3-6 exercises in each session. The weights should be such so that at the end of a set you could likely have performed 1-2 more reps, but it was still a slight struggle. You must also strive to get stronger over time. 3) Perform “cardio” 2-3 times per week. This is where you can fit in your exercise classes, runs, walks, do your intervals etc. There is nothing wrong with any of these activities and they certainly have their place. I also encourage people to do what they enjoy, just know that basing the majority of your training around them will not lead to optimal results in terms of body composition. To sum it up in one sentence – Eat a diet high in protein and veg, and low in junk, strength train with real effort 2-4 times per week, sweat hard 2-3 times per week, repeat for infinity. 12 Week Fit For Golf Online Training Program. This would be a great way to take care of the training side of your fat loss, and golf fitness goals. Tang, M., Armstrong, C.L., Leidy, H.J., Campbell, W.W. (2013) ‘Normal vs high protein weight loss diets in men: effects on body composition and indices of metabolic syndrome’, Obesity, 21(3), 204-210. Westcott, W.L. and La Rosa Loud, R. (2014) ‘Strength for fat loss, An effective method for increasing lean weight and losing fat weight’ American Fitness, January/February. Westcott, W., Apovian, C., DiNubile, N. et al (2013) ‘Nutrition programs enhance exercise effects on body composition and resting blood pressure’ The Physician and Sportsmedicine, 41(3), 85-91.